Offering food is one of the oldest and most common rituals of Buddhism. Food is given to monks during alms rounds and also ritually offered to tantric deities and hungry ghosts. Offering food is a meritorious act that also reminds us not to be greedy or selfish. The first Buddhist monks did not build monasteries. Instead, they were homeless mendicants who begged for all their food. Their only possessions were their robe and begging bowl. 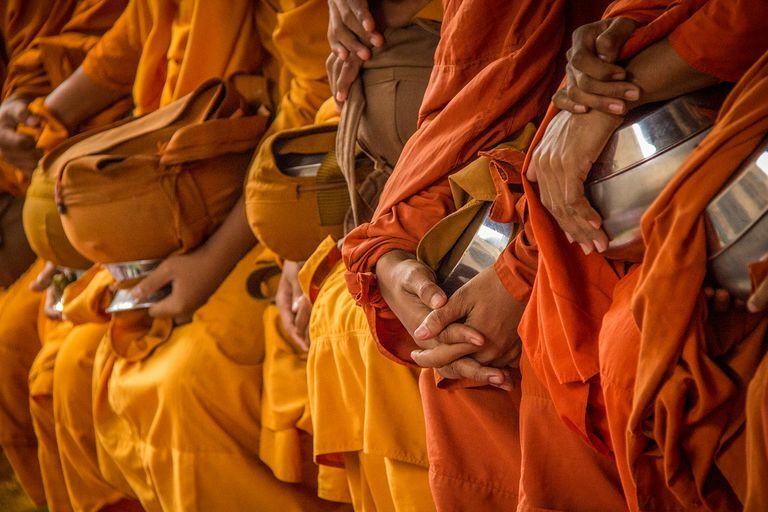 Today, in many predominately Theravada countries like Thailand, monks still rely on receiving alms for most of their food. The monks leave the monasteries early in the morning. They walk single file, oldest first, carrying their alms bowls in front of them. Laypeople wait for them, sometimes kneeling, and place food, flowers or incense sticks in the bowls. Women must be careful not to touch the monks. The monks do not speak, even to say thank you. The giving of alms is not thought of as charity. The giving and receiving of alms create a spiritual connection between the monastic and lay communities. Laypeople have a responsibility to support the monks physically, and the monks have an obligation to support the community spiritually. The practice of begging for alms has mostly disappeared in Mahayana countries, although in Japan monks periodically do takuhatsu, "request" (taku) "with eating bowls" (hatsu). Sometimes monks recite sutras in exchange for donations. Zen monks may go out in small groups, chanting "Ho" (dharma) as they walk, signifying that they are bringing the dharma. Monks practicing takuhatsu wear large straw hats that partly obscure their faces. The hats also prevent them from seeing the faces of those giving them alms. There is no giver and no receiver; just giving and receiving. This purifies the act of giving and receiving. Ceremonial food offerings also are a common practice in Buddhism. The precise rituals and doctrines behind them differ from one school to another. Food may be simply and silently left on an altar, with a small bow, or elaborate chants and full prostrations might accompany the offering. However, it is done, as with the alms given to monks, offering food on an altar is an act of connecting with the spiritual world. It is also a means to release selfishness and open the heart to the needs of others. It is a common practice in Zen to make food offerings to the hungry ghosts. During formal meals during sesshin, an offering bowl will be passed or brought to each person about to partake of the meal. Everyone takes a small piece of food from his bowl, touches it to the forehead, and places it in the offering bowl. The bowl is then ceremonially placed on the altar. Hungry ghosts represent all of our greed and thirst and clinging, which bind us to our sorrows and disappointments. By giving away something that we crave, we unbind ourselves from our own clinging and neediness to think of others. Eventually, the offered food is left out for birds and wild animals.